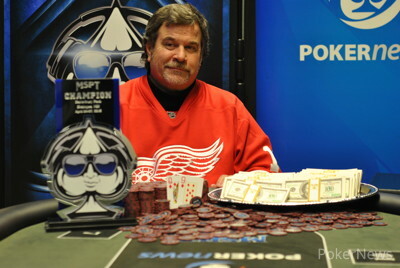 Dan Hendrickson Wins Mid-States Poker Tour Canterbury Park ($106,182)! 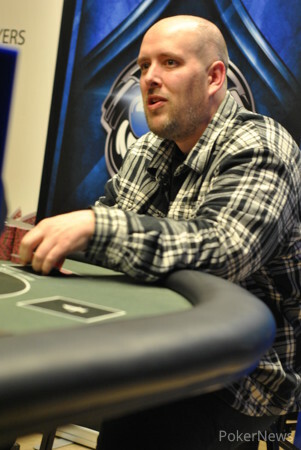 Seventy-eight players hit the felt on Day 2, and Hendrickson found himself at risk and nearly out the door shortly after the money bubble burst. During Level 22 (8,000/16,000/2,000), Hendrickson got his last 233,000 in preflop against Todd "sharkslayerr" Breyfogle with the against the . Breyfogle saw a safe enough flop, , but the dreaded turn gave Hendrickson plenty of outs, and the river was one of them. Loki Abboud hit the road first in 10th when Gary Loeffler outdrew his with the , and Norberto Santamaria wasn't far behind as he shoved with the and ran into Dahlin's . Shane Nelson lost a flip to Steve Webb to go out eighth, and the time was ripe for Dahlin to push his chip advantage with so many players hovering short. He was able to build up to about 3.5 million, about 40 percent of the chips in play with seven left. Hendrickson, who had a rough seat draw with Dahlin on his left, picked his spots to shove and reshove preflop to keep afloat until his first big break happened when he picked up aces to bust Loeffler, who jammed with threes. Dahlin then sent a short-stacked DJ Buckley packing, leading to a seemingly interminable five-handed stalemate. The shorter stack survived an amazing seven preflop all ins, including Hendrickson getting lucky with the against Dahlin's and then against Ryan Hartmann's . Finally, a three-outer courtesy of Dahlin sent Breyfogle packing in fifth. At this point, nobody's stack was safe against the massive blinds and antes, and Steve Webb busted fourth before Dahlin shoved over a button open from Hendrickson with the . "DQ" had the goods with the , though, and he held on to send the long-time chip leader out third. With stacks so short, the heads-up battle didn't last long, as Hendrickson raised the button to 600,000 at Level 33 (100,000/200,000/30,000) and then decided to gamble when Hartmann jammed for about 3.6 million. Hendrickson's flopped a queen against a disappointed Hartmann, who had the . "DQ" Dan Hendrickson opened for 600,000 on the button, and Ryan Hartmann jammed what he said was about 3.6 million. Hendrickson decided to gamble with , and it was a flip against Hartmann's . "My luckiest pair!" Hartmann exulted. It was an unlucky flop though: , giving Hendrickson a pair of queens and the lead. "Never win a title," Hartmann said with disgust. "One time, five." It wasn't to be, as a turn was followed by a river. Hartmann shook Hendrickson's hand and said he was happy for him. 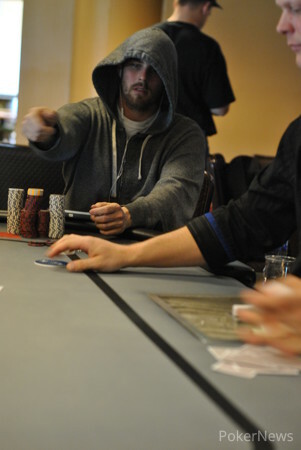 Ryan Hartmann shoved all in for 1.87 million over a raise from Dan Hendrickson, who tanked awhile. "Alright, let's do it," he said, calling with . "I knew you were light, I didn't think you'd call with that," a surprised Hartmann said, showing . He asked for a pair on the flop but got for a straight, turning Hendrickson dead with the . It's been Dan Hendrickson getting the better of the thus far small-pot poker that's been happening heads up. In one recent pot, he double-barreled an board for 200,000 on the flop and turn, getting a fold on fourth street. 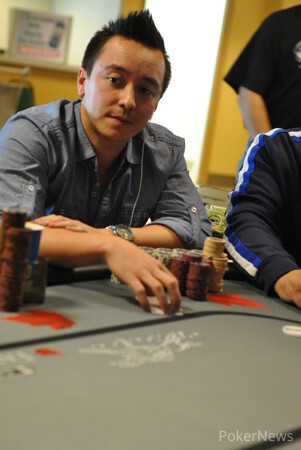 Dan Hendrickson raised to 450,000 on the button, and Adam Dahlin shoved for about 2.6 million in the small blind. Hendrickson called. Hendrickson's dominating hand held as the board rolled out . Steve Webb shoved under the gun for about 1.9 million, and Dan Hendrickson called on the button. A flop was void of any paint. The gave Webb an extra out, but the river was a blank.